For those that use their pickup truck for work, you are more than likely going to own a variety of tools. Therefore, investing into a quality truck tool box will allow you to keep the tools organized and protected within a weather-tight durable box. The best truck tool box is the Weather Guard Saddle Box, which opens to 90 degrees in order to provide easy access to all of your tools. Truck bed tool boxes are available in three main styles, which include a crossover, side mount and a chest. Most are an aluminum construction because it does not rust and it is fairly lightweight, which make it easier to install and remove. The choice of the type of truck tool box you require is dependent upon the truck beds configuration. For example, many truck owners use a tonneau cover, which wouldn’t work if you were to use a saddle box. Considering that the truck tool box is going to hold your valuables, its important that security is at its best. Therefore, you will want to ensure it has strong latches, reinforced lids and sidewalls, which will be able to withstand forced entries. Below is a list of the best truck tool boxes that are durable, weather tight and will help you organize your tools. Weatherguard is by far the most popular truck tool box manufacturer with a range of designs available. The saddle box style provides an easy solution to installation and allows you have room underneath the box too. Weather Guard are a premium brand when it comes to truck bed tool boxes but the 117502 is worth spending the extra due to the superior build quality. Overall, it is the best truck bed tool box you can buy that suspends from the side rails for easy installation. The Weather Guard 117502 Saddle Box is the ultimate example that built by one of the most reputable brands. If the price is too high, they do offer cheaper alternatives but the 117502 is the one to go for. For those requiring a crossover truck tool box but do not want to a premium price, then the UWS is the best option. However, just because it is cheaper, it does not mean that it lacks in build quality. It is constructed of extra thick aluminum and stainless steel handles for longevity. Visibility from the rear cab window can be obstructed by a bulky truck tool box but not with this one. The low profile design is a unique selling point of the UWS EC10451 and is a feature that many truck owners will find desirable. Overall, it is the best truck crossover tool box for the money that will be able to withstand harsh conditions and impacts for many years to come. Dee Zee is another brand that specialize in a range of products that are dedicated to the truck bed of a pickup. The Red Label Utility Chest is a heavy duty truck tool box that is constructed of a high grade aluminum with a powder coated finish. Due to the height of this truck tool box, you will want to double check that it fits below your tonneau cover. Compared to other chest tool boxes, the Dee Zee Red Label is quite tall, which may cause compatibility issues. Overall, it is an excellent all-rounder and one of the best options for those requiring a chest tool box for their truck bed. The Giantex is one of the cheapest solutions for a tool box for your truck. It is available in four different lengths (24, 29, 36 and 49 inches) with each being constructed of rugged aluminium that is resistant to rust. Overall, the Giantex is an affordable truck tool box that is available in a range of sizes to suit your truck. It is worth mentioning that it is not 100% weatherproof but by using aftermarket weather strips can keep the content dry inside. An alternative to both the saddle box and chest type of truck tool boxes is the UnderCover SwingCase. 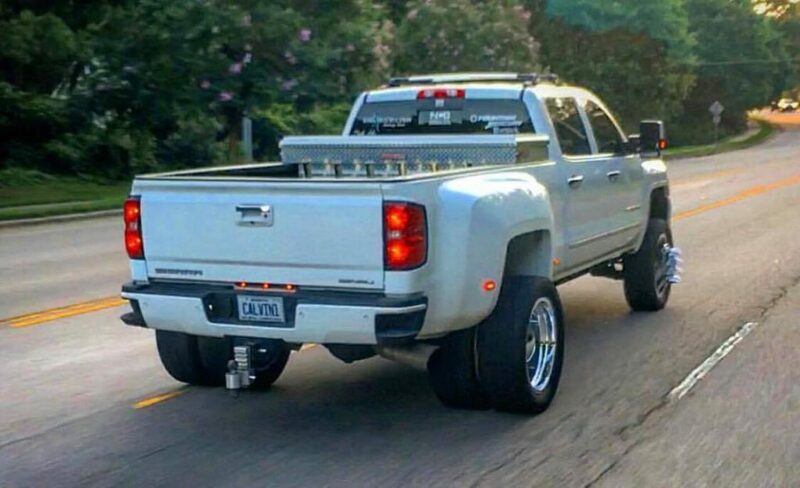 It is suitable for those that drive a Chevrolet Silverado or GMC Sierra and it connects to the side of the truck bed using just 6 screws. The UnderCover SwingCase is a unique solution to a truck tool box and is by far the easiest to install. Of course, it is not going to be suitable for every truck and may not even be able to fit all your tools due to the compact size. Overall, it is an excellent alternative to both the saddle and chest box types and can be easily removed for using as a tool box outside of the truck. As mentioned above, Dee Zee produce a wide variety of tool boxes for trucks, which includes this side mounted model. It is constructed of a rugged poly plastic and will not interfere with most truck bed covers. Overall, it is a cheaper alternative to the UnderCover tool box above but it may be too small for all your tools as it has a storage capacity of just 2.2 cubic feet. On the plus side, the reversible lid design can be quite useful if you change your mind on which side you wish the tool box to be located. When using your truck for work, you will not want to leave tools on the back of the truck bed. Not only will they be loose and move around whilst driving but the tools will not be organized either. However, investing into a quality truck bed tool box will solve all your problems. The main types of tool boxes for trucks include a crossover, side mount and chest. Each have their own benefits but its more important that they are compatible with your truck as some have different configurations. To help you make an informed buying decision, we have produced the below buying guide regarding truck tool boxes. There is a wide range of tool boxes for trucks available but choosing one that fits your requirements can be hard. Below are some details regarding each type to help you make up your mind. Crossover tool boxes are by far the most common and they mount against the back of the cab and sit on truck bed rails. Most will have a single lid that opens towards the window at the back but there are several variations, which feature double lids. The main benefit is the fact they have a much larger capacity than all of the other different types. As they do not touch the bed of the truck, there is a space in between the bed and the tool box. This space is great for hauling goods that are long in length. Instead of being mounted on the bed rails, the chest box sits on the bed of he truck. They are available in a range of different sizes and as they are not mounted on the bed rails, they will not effect any truck bed covers or canopies. However, when it comes to short trucks, the chest truck tool box may reduce much needed length. Side mounted truck bed tool boxes are an excellent alternative that can be used alongside both the crossover and chest box. They can range in a variety of lengths but they are often not as wide, which can make storing some tools a struggle. Many tool box manufacturers are developing a range of clever designs to maximize truck bed space. 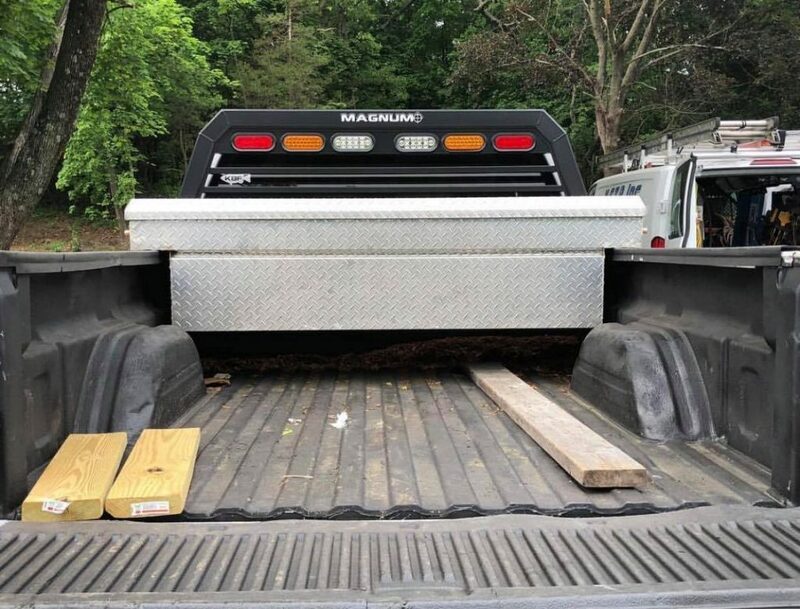 Some do not even touch the bed of the truck and instead connect to the trailer hitch and even under the bed of the truck. The purpose of installing a truck bed tool box is to help store all your tools. However, if you cannot store all of them inside the box, it may become a problem. We always recommended purchasing the largest cargo capacity that your truck is compatible with. It is always better to exceed the capacity that not having the space to store all of your tools in the box. The most common materials used within the construction of a tuck bed tool box are aluminum, stainless steel, plastic and steel. Aluminum is by far the most popular and for good reason too. It is strong, lightweight, resistant to rust and relatively affordable. Choosing a tool box that is made completely from stainless steel will come with a much higher price tag. They are stronger than aluminum, rust resistant and generally looks and feels better than any other material. Steel is the cheapest option and although it is a heavy duty material, it is not resistant to rust. If it has not been powder coated, it can begin to rust overtime, which can ruin the appearance of the box as the rust begins to spread. If it is not powder coated, we strongly recommend painting it yourself to improve its longevity. Some smaller tool boxes that are used as a side mount or wheel well box are constructed of rugged plastic. They will not be able to withstand as much heavy impact damage but under light usage, they can be very long lasting. Intuitive design features can make all the difference when compared to a tool box that is just a storage container. Considering that the tool box is storing your valuables, it is important that it is kept secure. Most come with basic locks but premium truck bed tool boxes come with extra special locks that are more secure. The materials used in the construction also need to be strong because cheap plastic or metals can easily break with heavy impacts. Another factor that many people forget is the way the truck tool box is mounting upon the bed. If it is not mounting properly using the correct hardware, it may be possible to manually pull the tool box out. When it comes to deciding on the type of truck bed tool box you want, it is vital that you take measurement beforehand. You will want to measure the width as well as the height of the box. Some tool boxes may reduce rear view visibility quite significantly, which can be big issues for some people. All of our recommendations cover a wide variety of tool boxes as well as budgets. Investing a little extra into a durable tool box for your truck is highly advised as it will be long lasting and be able to withstand more punishment from heavy usage.